Adapt battery sizes, extend battery life or hold batteries in place. Description: 1.5V & 3V lithium button and coin battery tester. ABS body with nickel plated pins to prevent corrosion. India. Description: Solid brass reproduction battery holder is 1-3/8" diameter and 3-3/4"tall. Designed to slide into the Brillie battery clip. Holds a "D" battery, not included. Description: Pass a button cell through the proper slot in the plastic gauge. Identifies the correct battery. 3-9/16" x 8-7/8". India. Description: Assortment includes 4 pieces each of #386 & #386; 8 pieces each of #357, #377 & #392; 10 pieces each of #364. 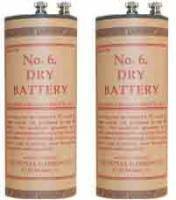 Description: A replacement for #8 or #9 battery. Simply insert 2-AA batteries (not included) and place the converter into the base of the clock. Description: Easily tests 1.5V and 3V batteries. With indicator light. Made in India. Description: Factory fresh replacement fits SP387-S. Batteries can be combined for price discounts on 5 pieces or 10 pieces. Description: Factory fresh replacement fits L44 (A01). Batteries can be combined for price discounts on 5 pieces or 10 pieces. Description: Factory fresh replacement fits CR1616 (L28). Batteries can be combined for price discounts on 5 pieces or 10 pieces. Description: Factory fresh replacement fits SP337 (SR416SW). Batteries can be combined for price discounts on 5 pieces or 10 pieces. Description: Factory fresh replacement fits SP389 (SR1130W) & SP390 (SR1130SW). Batteries can be combined for price discounts on 5 pieces or 10 pieces. Description: Factory fresh replacement fits Cr2016 (L10). Batteries can be combined for price discounts on 5 pieces or 10 pieces. Description: Factory fresh replacement fits CR1025 (L44). Batteries can be combined for price discounts on 5 pieces or 10 pieces. Description: Factory fresh replacement fits SP393 (SR48W). Batteries can be combined for price discounts on 5 pieces or 10 pieces. Description: Factory fresh replacement fits SCR1220 (L04). Batteries can be combined for price discounts on 5 pieces or 10 pieces. Description: Factory fresh replacement fits SP395 (SR927SW) & SP399 (SR927W). Batteries can be combined for price discounts on 5 pieces or 10 pieces. Description: Factory fresh replacement fits SP341. Batteries can be combined for price discounts on 5 pieces or 10 pieces. Description: Factory fresh replacement fits CR2320 (L26). Batteries can be combined for price discounts on 5 pieces or 10 pieces. Description: Factory fresh replacement fits SP396 (SR726W) & SP397 (SR726SW). Batteries can be combined for price discounts on 5 pieces or 10 pieces. Description: Factory fresh replacement fits SP346 (SR712SW). Batteries can be combined for price discounts on 5 pieces or 10 pieces. Description: Factory fresh replacement fits CR2430 (L20). Batteries can be combined for price discounts on 5 pieces or 10 pieces. Description: Factory fresh replacement fits SP384 (SR41SW) & SP392 (SR41W). Batteries can be combined for price discounts on 5 pieces or 10 pieces. Description: Factory fresh replacement fits Cr1216 (L40). Batteries can be combined for price discounts on 5 pieces or 10 pieces. Description: Factory fresh replacement fits BR1225 (L09). Batteries can be combined for price discounts on 5 pieces or 10 pieces. Description: Factory fresh replacement fits SP315 (SR716SW). Batteries can be combined for price discounts on 5 pieces or 10 pieces. Description: Factory fresh replacement fits Cr2025 (L12). Batteries can be combined for price discounts on 5 pieces or 10 pieces. Description: Factory fresh replacement fits SP372 (SR916W) & SP373 (SR916SW). Batteries can be combined for price discounts on 5 pieces or 10 pieces. Description: Factory fresh replacement fits Cr2032 (L14). Batteries can be combined for price discounts on 5 pieces or 10 pieces. 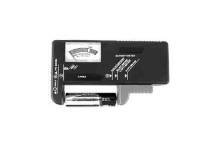 Description: Battery tester for all types of batteries for watches and clocks. Use with mercury, silver and lithium batteries. Description: Watch battery changing kit includes 3 types of case openers, plastic tweezers, "AA" tweezers, a screwdriver, pliers, and a cleaning brush in a storage pouch. Made in India. Description: Factory fresh replacement fits SP329 (SR731SW). Batteries can be combined for price discounts on 5 pieces or 10 pieces. 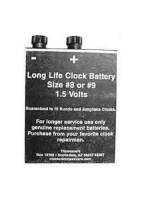 Description: #8 or #9 battery for Kundo and Junghans battery clocks. 4" x 3-1/4" x 3/4". Description: Factory fresh replacement fits SP319 (SR527SW). Batteries can be combined for price discounts on 5 pieces or 10 pieces. 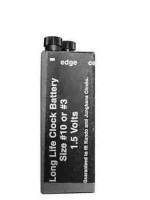 Description: #10 or #3 battery for Kundo and Junghans battery clocks. 1-1/2" x 1-1/2" x 4". Description: Factory fresh replacement fits SP379 (SR521SW). Batteries can be combined for price discounts on 5 pieces or 10 pieces. Description: Factory fresh replacement fits SP321 (SR616SW). Batteries can be combined for price discounts on 5 pieces or 10 pieces. Description: Factory fresh replacement fits CR1620 (L08). Batteries can be combined for price discounts on 5 pieces or 10 pieces. Description: Factory fresh replacement fits SP361 (SR721W) & SP362 (SR721SW). Batteries can be combined for price discounts on 5 pieces or 10 pieces. 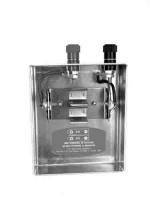 Description: Factory fresh replacement fits SP303 (SR44SW) & SP357 (SR44W). Batteries can be combined for price discounts on 5 pieces or 10 pieces. Description: Factory fresh replacement fits CR2012 (L42). Batteries can be combined for price discounts on 5 pieces or 10 pieces. Description: Factory fresh replacement fits SP363 & SP364 (SR621SW). Batteries can be combined for price discounts on 5 pieces or 10 pieces. Description: Factory fresh replacement fits SP317 (SR516SW). Batteries can be combined for price discounts on 5 pieces or 10 pieces. Description: Factory fresh replacement fits L43 (A03). Batteries can be combined for price discounts on 5 pieces or 10 pieces. Description: Factory fresh replacement fits SP370 (SR920W) & SP371 (SR920SW). Batteries can be combined for price discounts on 5 pieces or 10 pieces. Description: Factory fresh replacement fits SP376 (SR626W) & SP377 (SR626SW). Batteries can be combined for price discounts on 5 pieces or 10 pieces. Description: Factory fresh replacement fits SP381 (SR1120SW) & SP391 (SR1120W). Batteries can be combined for price discounts on 5 pieces or 10 pieces. Description: Factory fresh replacement fits SP301 (SR43SW) & SP386 (SR43W). Batteries can be combined for price discounts on 5 pieces or 10 pieces. Description: Factory fresh replacement fits SP380 & SP394 (SR936SW). Batteries can be combined for price discounts on 5 pieces or 10 pieces. Description: Factory fresh replacement fits SP365 (SR1116W). Batteries can be combined for price discounts on 5 pieces or 10 pieces. Description: Factory fresh replacement fits SP366 (SR1116SW). Batteries can be combined for price discounts on 5 pieces or 10 pieces. Description: Factory fresh replacement fits SP344 & SP350 (SR1136SW). Batteries can be combined for price discounts on 5 pieces or 10 pieces. Description: Factory fresh replacement fits SP335 (SR512SW). Batteries can be combined for price discounts on 5 pieces or 10 pieces.